A rabbet is a right-angle groove or notch cut into the edge of a board. You can also think of it as an open-sided dado that runs along the edge of a board rather than in the center of the stock. A rabbet is great for when a shelf needs to be placed flush with the top of the shelf standard (vertical support piece) or for recessing a plywood back on a cabinet. It's also used to receive glass panels on doors. Rabbets typically are cut with a table saw or a router. As with a dado, one of the most common ways to cut a rabbet is with a stacked dado head cutting set on a table saw. 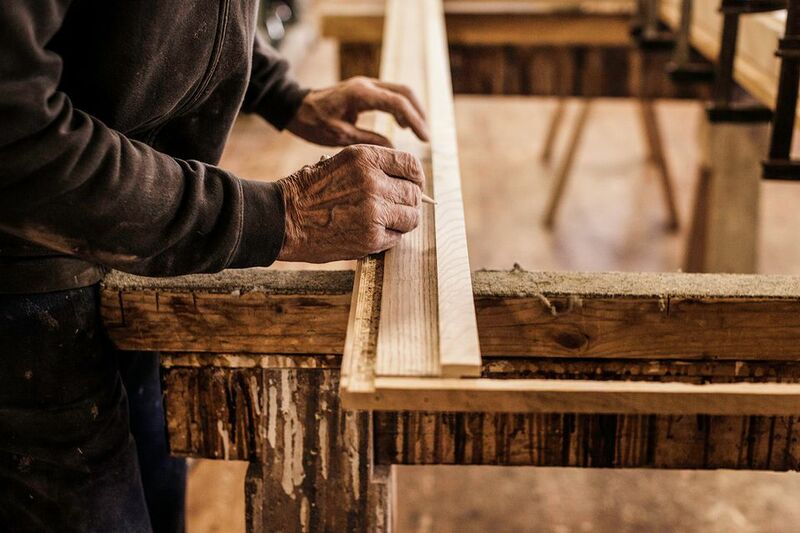 Traditionally, a sacrificial strip of wood is secured to the fence and the fence is then moved against the dado set, covering part of the blade as needed. This method prevents damage to the table saw's fence. Another method for cutting rabbets on a table saw is to use a standard blade and make two passes with the stock. The stock is flat against the table for one cut and is held vertically against the fence for the other cut. The two cuts meet precisely at the inside corner of the rabbet, thereby cutting out an L-shaped notch. This method often is more convenient than setting up a dado head and is preferred if you need to make only a few cuts. A handheld router must be used for all interior cuts and cuts on assembled projects, such as bookshelves or cabinet boxes. Perhaps the easiest way to cut a rabbet is with a handheld router and a special bit called a rabbeting bit or piloted rabbeting bit. This bit has a bearing that rides along the edge of the stock so the width of the rabbet is always the same. Bits are sold in a variety of cutting widths, up to about 1/2 inch. You adjust the depth of the rabbet by changing the cutting depth on the router. The disadvantage of a rabbeting bit is that the bit transfers any dips or bumps along the stock's edge to the rabbet cut because the bearing follows the edge. You can also cut a rabbet with a standard straight bit, using a straightedge (such as a board or level clamped to the workpiece) or an edge guide attachment to guide the router. The straightedge or edge guide sets the width of the rabbet cut. The depth of the cut is set with the router's cutting depth. Another common method for cutting a rabbet is to use a router table with a straight bit. Use a feather board to hold the stock down to the table and ensure a consistent cut. A router table is more convenient for multiple cuts than a straightedge setup, and it's more consistent than a rabbeting bit, which follows the material's edge.